The Karuk language originated around the Klamath River between Seiad Valley and Bluff Creek. Prior to European contact, it is estimated that there may have been up to 1,500 speakers. Linguist William Bright documented the Karuk language and when Bright began his studies in 1949 there were "a couple of hundred fluent speakers," but by 2011, there were fewer than a dozen fluent elders. A standardized system for writing the languages was adopted in the 1980s. Karuk is a language isolate, sharing few if any similarities with other nearby languages. Historically, the American linguist Edward Sapir proposed it be classified as part of the Hokan family he hypothesized although little evidence supports this proposal. As Bright wrote, "The Karok language is not closely or obviously related to any other (in the area), but has been classified as a member of the northern group of Hokan languages, in a subgroup which includes Chimariko and the Shasta languages, spoken in the same general part of California as Karok itself." Karuk is spoken within the range of the original territory where the Karuk people lived prior to European contact. 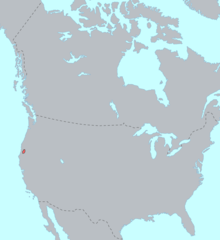 The ancestral territory is in Northwestern California existing in Siskiyou, Humboldt, and Del Norte counties. The language originated around the Klamath River between Seiad Valley and Bluff Creek. Karuk is most notably found in towns Somes Bar, which is near The Karuk Center of the World (in Karuk, "Katimiin"), Happy Camp ("Athithufvuunupma"), and Orleans ("Panamniik"). There are only 5 vowels in Karuk, as shown by the chart, where a, i, and u have both long and short forms, while e and o are in the long form. Karuk only has 16 consonants, a small compared to the relatively large consonant inventories of most California languages. Karuk also does not show any modifications to its consonants like glottalization or labialization, also unusual for a California language. When two high vowels are juxtaposed in a word, then the first vowel turns into a glide in the following examples. Note: Syllabification in these examples are from right-to-left. The following example is a more rare case in Karuk where the syllabification is from left-to-right. Karuk is similar to many other American Indian Languages because "verbs bear a complex person-marking system, where subject and object are marked in portmanteau prefixes." Depending on the subject and the object the speaker is referring to, there is a prefix for both positive and negative indicatives, as well as a prefix for the potential mood. Through his research, William Bright found there to insufficient words to describe cardinal directions, but the language uses suffixes on verbs to describe relevant direction. Many motion verbs have a singular and plural form. Through morphology, long-form vowels are used when a is next to i or u. Karuk uses accents where vowels can sound differently in each word, making the language difficult to learn. Although the structure may be similar, Karuk is considered to be much different than its neighboring languages, such as Yurok. Karuk uses prefixes and suffixes in a way William Bright relates to how English words snort, sniff, and sneeze all start with a sn-. The following are examples of prefixes in Karuk. kári xás pihnêefich upiip, pûuhara. Then coyote said, "no." koovúra yúruk kámvuunupahitih. Let it all flow downstream. Note: More translations can be found online in the Dictionary section depicting Dr. Bright's research. Dr. William Bright started studying the Karuk language in 1949 in pursuit of his doctorate in linguistics at U.C Berkeley. Bright was met with open arms by tribal elders and was taken in and called Uhyanapatánvaanich, or "little word-asker" in Karuk. A little under a decade later, Bright published The Karok Language (University of California), which was a highly informative piece on the Karuk language, its grammar, and syntax. Bright worked with Susan Gehr, a tribe member and fellow linguist, on a Karuk dictionary, which was published in 2005. Bright was a different type of linguist because he did not see language without cultural context. He would record everyday conversations, songs, stories, and poetry of fluent Karuk speakers to attempt to capture the language and what it meant to those speaking it. He spent over fifty years studying, researching, and documenting Karuk, and is the only non-Indian to be inducted as an honorary member of the tribe thanks to his contributions to the community. Bright was buried on Karuk land when he died in 2006. In the late 1980s, Humboldt State University started the "American Indian Bilingual Teacher Credential Program", where they brought in teachers from four local tribes, being the Hupa, Yurok, Karuk, and Tolowa. These teachers were bilingual in their tribe's native language as well as English, and would be employed in local public schools to teach American Indian children. The university developed this initiative to help local American Indian populations either further develop their English for higher education or improve upon their native language to preserve culture. Bilingual teachers in both Karuk and English would teach Orleans Elementary and Happy Camp Elementary, where children would learn how to live in America while keeping their identity. In 1990, attempts were made to revive the language by The Karuk Language Restoration Committee. This committee, composed of eight volunteers, drafted a 5-year minimum plan in attempt to preserve the Karuk language and help it grow in the future. The committee was also advised by Dr. William Bright and tribal member Julian Lang, a dedicated researcher of the language. Their studies showed that the decline of the language is caused by a combination of a lack of younger fluent speakers, the number of speakers is falling in general, it is not typically taught at home at young ages, it is not flexible to be modernized, and most tribal members cannot read the Karuk language. Recording and writing down fluent speakers communicating in Karuk. Training more people to become fluent for a long-term goal. Teaching tribal members and local communities why learning the language is vital to not only the language, but also to the culture. Reviewing and receiving community feedback regarding the current plan. Facilitating the community to participate in programs that have people practice and speak Karuk. Karuk Dictionary Online Karuk dictionary hosted by UC Berkeley Linguistics. William Bright (2005). Karuk Dictionary. Los Angeles, CA. ^ Hammarström, Harald; Forkel, Robert; Haspelmath, Martin, eds. (2017). "Karok". Glottolog 3.0. Jena, Germany: Max Planck Institute for the Science of Human History. ^ a b Lyle Campbell (2000-09-21). American Indian Languages. Oxford University Press. ISBN 978-0-19-534983-2. ^ a b c d e "Karuk – Survey of California and Other Indian Languages". linguistics.berkeley.edu. Retrieved 2017-04-29. ^ Walters, Heidi (October 27, 2011). "In Karuk: A family struggles to bring its ancestral tongue back to life". North Coast Journal. Retrieved October 4, 2013. ^ William Bright (1957). The Karok Language, by William Bright. University of California Press. ^ a b Gehr, Susan. "Karuk Ancestral Territory Map - Karuk Language Resources on the Web". karuk.org. Retrieved 2017-04-30. ^ a b c Levi, Susannah (27 September 2008). "Phonemic vs. derived glides". ScienceDirect. ^ Shirley Silver; Wick R. Miller (1997). American Indian languages: cultural and social contexts. University of Arizona Press. ISBN 978-0-8165-1802-9. ^ Bennett, Ruth (1 March 1987). "American Indian Bilingual Education" (PDF). eric.ed.gov. ^ Macaulay, Monica (1993-01-01). "Reduplication and the Structure of the Karuk Verb Stem". International Journal of American Linguistics. 59 (1): 64–81. doi:10.1086/466185. JSTOR 1265470. ^ a b "Ararahih'urípih". linguistics.berkeley.edu. Retrieved 2017-04-29. ^ Albers Jr., Phil. "Karuk Words". www.karuk.us. Retrieved 2017-04-29. ^ a b c Fox, Margalit (2006-10-23). "William Bright, 78, Expert in Indigenous Languages, Is Dead". The New York Times. ISSN 0362-4331. Retrieved 2017-04-29. ^ Walters, Heidi. "In Karuk". North Coast Journal. Retrieved 2017-04-29. ^ a b Bennett, Ruth (1 March 1987). "American Indian Bilingual Education" (PDF). eric.ed.gov. ^ a b c Burcell-Price, Suzanne (30 August 1990). "Karuk Language Restoration Committee nearing completion of five-year plan". Ebscohost. ^ Gehr, Susan; Bright, William (2005). Karuk Dictionary. Los Angeles, CA: LBD Publishers. ISBN 978-1-933408-03-3. Philip Drucker (1965). Cultures of the north Pacific coast. Chandler Pub. Co.
Nancy Richardson (1993). Now you're speaking - Karuk! : Araráhih, the people's language. Center for Indian Community Development, Humboldt State University. Live Your Language Alliance (LYLA) Working to speak and hear traditional languages of the Tolowa, Karuk, Yurok, Hupa, Tsnungwe, Wiyot, Mattole, and Wailaki. This page was last edited on 11 February 2019, at 13:50 (UTC).